You’re not cool unless you have a mechanical keyboard. No, you won’t be able to tell if your coworkers don’t like it, because you won’t be able to hear their complaining over the sound of your clack-clack-clacking. 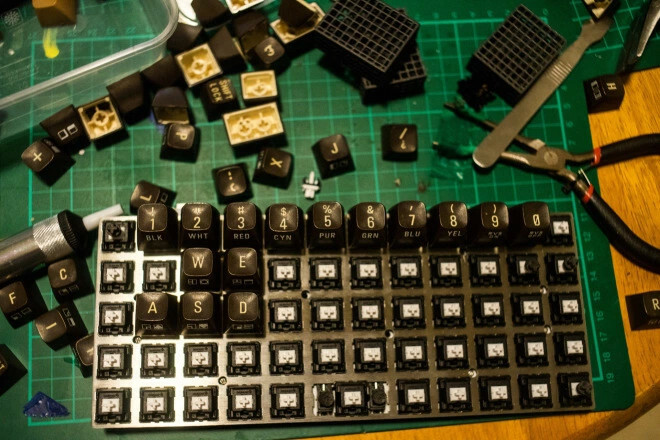 You can even go all-in with switch modifications, o-rings, and new springs, or you could use your 3D printer to modify the touch of your wonderful Cherry MX switches. That’s what a few researchers did, and the results are promising. The ‘problem’ this research is attempting to solve is bottoming out on Cherry MX keyswitches. If you’re bottoming out, you’re doing it wrong, but nevertheless, you can get a publication out of solving repetitive strain injury. This was done by modeling the bottom housing of a Cherry MX switch by printing most of it in nylon on a Stratasys Objet 350 polyjet printer, with a tiny bit of of the housing printed with a polymer with a hardness of Shore 40. No, Shore A, Shore B, or Shore 00 was not specified, but hey, it’s just a conference paper. The experimental test for this keyswitch was dropping a 150 gram weight from 125 mm onto the keyswitch, with a force sensitive resistor underneath the switch, connected to an Arduino. Data was logged, filtered, and fitted in Excel to create a plot of the force on dampened, rigid, and commercial switch housings. Results from ANOVA were p > 0.05 (p=0.12). Despite the lack of significant results, there is something here. The Objet is one of the few printers that can do multimaterial printing with the resolution needed to replicate an injection molded part. There is a trend to the data, and printing squishy parts into a keyswitch should improve typing feel. There will be more work on this, but in the meantime we’re hopeful some other experimenters will pick up this train of research.